Cobalt C4209 Vector Network Analyzer is an S-parameter vector network analyzer designed for operation with an external PC. The software package runs on any Windows-capable machine via USB and delivers accurate testing and measurement through a platform that can keep up with constant advancements as well as be remotely accessed. 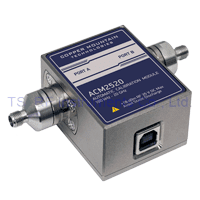 Cobalt C4209 Vector Network Analyzer is an excellent solution for performing the full range of magnitude and phase measurements over the frequency from 100 kHz to 9.0 GHz. Planar 804/1 provides a wide variety of analysis capabilities in the frequency and time domains as well as the frequency offset mode feature. The C4209 is capable of analyzing the frequency range from 100 kHz to 9 GHz, offers a typical dynamic range of 145 dB, and is designed for operation with any Windows PC or laptop. It efficiently handles advanced test applications, and with dimension of 14.8" x 8.3" x 3.7" (377 x 210 x 95 mm) and a weight of just 10.5 lbs. (4.8 kg), the smaller C1209 is about a “half rack” in width making it optimal for engineers looking for fast production without requiring a lot of space.